How do local businesses capitalise on the game-changing effects of the upcoming International Broadband Submarine Cable, landing at Maroochydore in 2020? 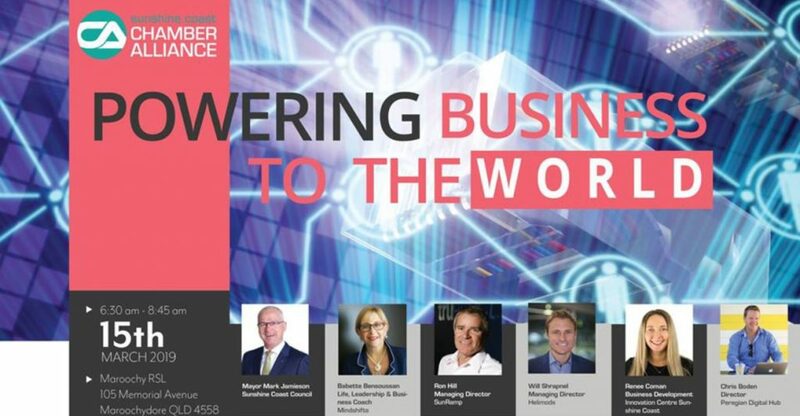 This was the big topic of discussion at the Sunshine Coast Chamber Alliance’s Powering Business to the World business breakfast – proudly partnered by RDA Sunshine Coast – held at the Maroochy RSL Events Centre, Maroochydore on Friday, March 15. An 120-strong crowd of business leaders from a diverse range of industries, including tech, real estate and automotive, turned out in force to see an expert business panel, including Sunshine Coast Mayor Mark Jamieson and SunRamp International founder Ron Hill. The panel revealed how our local digital revolution supports local businesses to change the way they work, adapt their business models and meet ever-increasing customer expectations. The cable is expected to greatly stimulate local business, generate new investment and improve the region’s telecommunications diversity to Australia’s east coast. From 2020, the cable will deliver Australia’s fastest telecommunications connection to Asia and the second fastest to the United States. Sunshine Coast Council says independent modelling forecasts show the cable will generate up to 864 new jobs and up to $927 million in new investment throughout Queensland. SunRamp International founder Ron Hill said the cable opened up the Sunshine Coast to the world as a leading investment destination for commerce and industry, offering high-tech businesses much more reason to establish bases here. He also believes the cable will greater position the Coast as a thriving tech ecosystem now equipped to grow both new and existing investment in the region, akin to the Colorado start-up scene, one of the highest concentrations of tech employment in the country. Some industries that may directly benefit from the cable include e-gaming; creative services; construction and design; education; health services; financial services and any tech business requiring high volumes of data to power artificial intelligence, machine learning and associated technologies. For more information, the Sunshine Coast Chamber Alliance has released an event wrap-up video here: https://www.youtube.com/watch?v=jRMdIUJAjMU&feature=youtu.be&fbclid=IwAR1msSnNqdXbIzJvbZfgcOVhjV4q_SbMXfQrenz_lsV61H7b_s0dwWd5Ix4. This entry was posted in News and tagged Business, Entrepreneurship, innovation, International Broadband Submarine Cable, RDA Sunshine Coast, Ripple Effect, SunRamp International, sunshine coast, Sunshine Coast Chamber Alliance, Sunshine Coast Mayor Mark Jamieson.